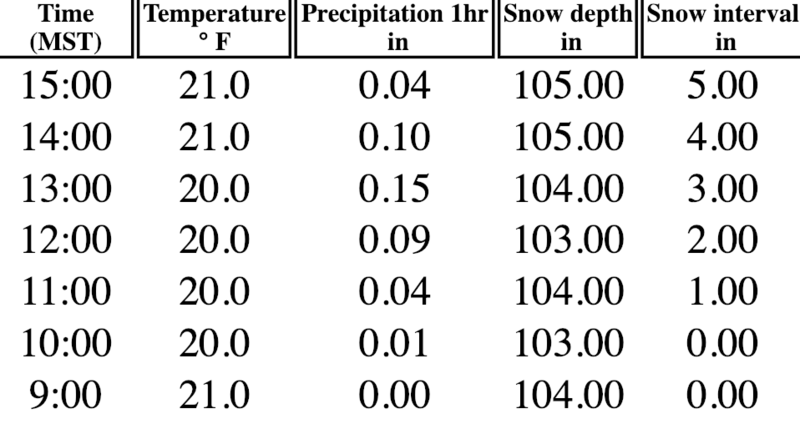 For the last few weeks, we’ve been just sitting above and below the 100’ mark for snow depth at Alta-Collins. Rumored to be the point at which the skiing in the Wasatch gets really good as the rocks disappear and steep lines open up, and a mark that we didn’t really get much past last year. This storm cycle looks to be the one to finally vault us well across the line. 5″ in 6 hours at Collins with quite a bit more on the way, leaving the 100″ depth mark in the dust. At the time of this writing, there’s 5” on the stake at Collins, and the radar indicates that it’s still coming down, for now. In the ‘nowcast’ period, the HRRR suggests a lull for a few hours, with heavy snowfall starting back up in the Wasatch around 1 AM. The HRRR suggests precipitation that is heavy and stratiform in nature, which should amount to a fairly even distribution of precipitation amongst the various ski areas in northern Utah. Depending on how much faith you put in the ‘favored on southwest flow’ moniker for a stratiform event like this, areas like Brighton, Park City, and Deer Valley could do fairly well in liquid equivalent. The real challenge for lower elevation base areas is the Snow-Liquid Ratio (SLR). For a warm atmospheric river event like this with strong southwest flow and warm advection, we expect a heavier, cream-cheese like snow at most if not all elevations. By now, it seems we are on the other side of the game and can expect falling temperatures overnight. At some point overnight I’d expect snowfall to begin to accumulate at the valley floor, continuing through Tuesday. The time-height and the HRRR loop do a good job at collectively illustrating the gradual cooling while still under SW flow – a good scenario, albeit a somewhat less intuitive one. NAM-12km Time-Height cross-sections for KSLC illustrating the substantial moisture and instability, falling freezing level, vertical wind profile, and its gradual shift towards NW flow by Wednesday. Winds will begin to turn towards the NW throughout the afternoon Tuesday, while a much more well-defined cold front and upper-level trough will traverse the region early on Wednesday morning. While the layer of moisture will shallow behind the front, favorable conditions for orographic-driven snowfall remain through midday Thursday. If you can get out and ski during the week, I’ll certainly be jealous – it’s likely going to be very, very good.